If you’re a celebrity, whose life is lived so very publicly, it’s a big no no to repeat the same clothes. Well, not really. Especially if you are Ninomiya Kazunari. This is a story about Nino and his favorite shirt. His color in Arashi is yellow so of course, his favorite shirt has to be…mustard. No one really knows the story behind this shirt. But he was first spotted wearing it in New York in 2013 when they went there to learn the choreography for Paradox (LOVE album, 2013) with JaQuel Knight. They also went to watch a concert while there (I forget which concert it was now edit: it was the JZ and Justin Timberlake concert, thanks @ailamarie!). 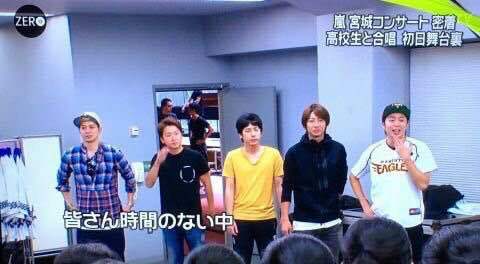 Then the mustard shirt reappeared again when Arashi went to Hawaii in September last year for the Blast in Hawaii 15th anniversary concerts. A year later, in September this year, Mr Mustard showed up again when they greeted one of the school choirs participating at the disaster aid Blast in Miyagi concerts. 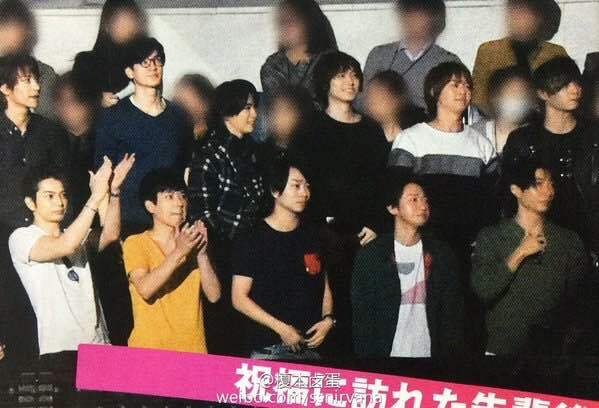 And just over the weekend, the favorite shirt was back as Arashi went to watch V6 senpais’ 20th anniversary concert at Yoyogi (and later back-danced to Take Me Higher). It has become a running joke among Arashians that if only fans can send gifts to them, they’d probably have sent Nino dozens of the same mustard shirt. But guess who probably stole or “borrowed” that same shirt? 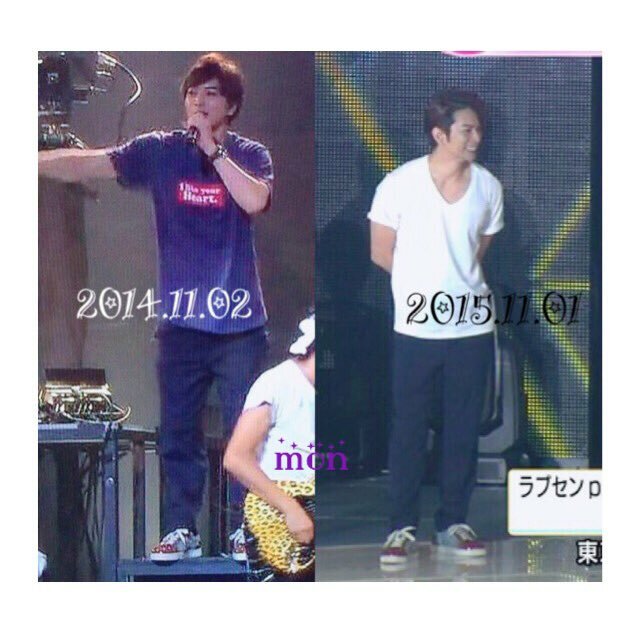 Speaking of Jun, he was also spotted at the V6 concert wearing the same shoes as the one he wore to TOKIO’s 20th anniversary concert a year and a day ago. But while no one knows what brand of shirt Nino is wearing, J’s shoes are Louboutin. Of course, nothing less but Loubs for Arashi’s resident fashionista. But seriously, it’s refreshing to see them repeat the same clothes (and shoes for that matter). It’s not just Nino’s mustard shirt that has made several encores, it’s just the one that’s so noticeable because of the color. But for sure, the other Arashi members have repeatedly worn clothes as if they don’t get paid enough to buy a new wardrobe every season, or heck, a new wardrobe every freakin’ day of the year. And that is why I find it refreshing. Because in an era of superficial idols whose airport and every day fashion gets “reported” on by entertainment media (and heavily sponsored as well by brands and fans alike), there’s a bunch of guys who couldn’t care less how they look or what they wear (okay, maybe MJ does). This mustard shirt is symbolic in a way because it shows just how down-to-earth these bakas are and how they aren’t victims of that trap called fame. They may be rich to buy flashy things and show off but they’ve been living their lives in a simple and low-key manner, and I find that inspiring. 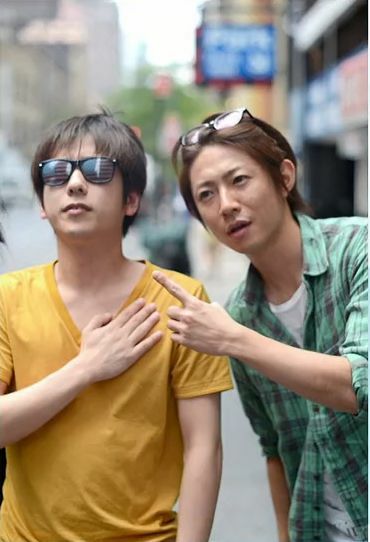 And I love this mustard shirt because it reminds me that Arashi are just like you and me. So I wonder when will we see the mustard shirt again? That’s Arashi – very ordinary guys. I love how they are very much aware of their status as Japan’s top idols but also at the same not care much about image. They trust their fans enough to know that they are regular guys. yes, that’s why I respect them more too because they have stayed grounded despite being swept up in this storm called fame.